I like baking savory cookies because it gives me an excuse to open a bottle of wine. Hello apéro! A drink, a snack and a podcast make getting the rest of dinner on the table less of a chore. The Rosemary-Parm Cookies are from the “cocktail cookie” section of the book. 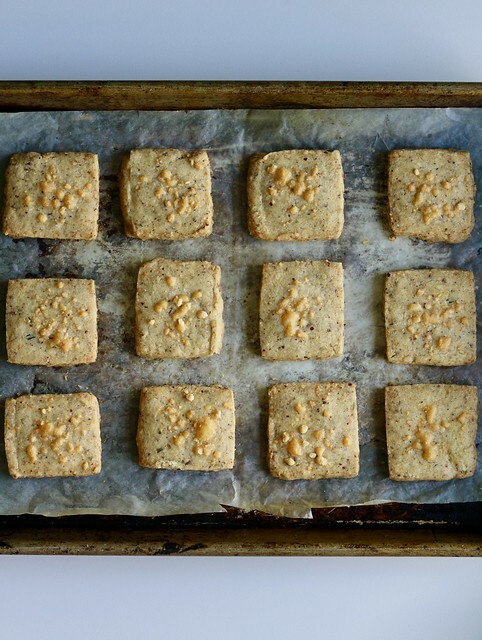 They are savory shortbread cookies, delicate and crumbly, and flavored with parmesan, pecans and rosemary. I cut mine into (imperfect) squares rather than rounds so I wouldn’t have any waste, and sprinkled them with a bit of extra grated cheese before baking. They’re salty and cheesy, and I can verify that they go quite nicely with white wine! For the recipe, see Dorie’s Cookies by Dorie Greenspan. Don’t forget to check out the rest of the TWD Blogroll! These look so good – can’t wait to make them on the weekend! I need to make these as well. I need to think of a good cocktail time to make them. I like your idea of squares. I like your plan for dinner prep! I also think i may borrow your square cookie technique when I make them next. This time, I gathered the scraps into a few “ugly cookies” rather than re-rolling them.